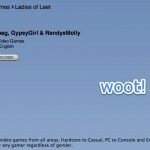 Ladies of Leet in iTunes! Well we finally made it to iTunes! Please feel free to subscribe & leave a comment! A big thank you goes out to everyone that has listen & commented on the site on the site so far. We are loving doing this and are excited to make Episode 2 on October 3rd! Ladies of Leet is planned to be a bi-monthly podcast? Ah, cool! Actually, bi-weekly and bi-monthly both have two means. Bi-weekly can be either twice a week, or once every two weeks, while bi-monthly can be twice a month, or once every two months. Go English!